MOFFAT Beach’s Reef Heazlewood is a genuine talent. 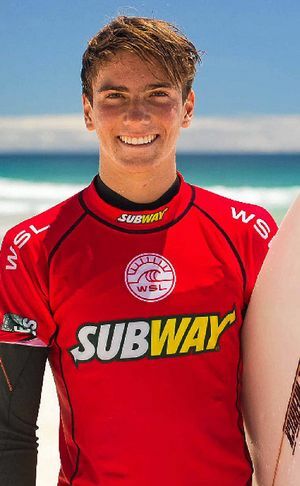 The teenager was the runner-up at last year’s ISA World Junior Surfing Championships and the 16-year-old is now poised for another big year. The Daily caught up with him. Q: You’re currently at the first Australasian Pro Junior event of the season, at the Gold Coast. How are things going there? I got through the first and second rounds and am into the third round so I’m pretty happy. Q: Is this your first event for the year? I competed at Maroubra in a QS (Qualifying Series) 1000 and got through a few rounds of that. Q: Are you pleased with how you’ve started the year? Yeah, I’m in a good mindset. I haven’t had too many comps since October so it was nice to (then) smooth out some things in my surfing. My boards are feeling great, I’m feeling great and I’m pretty happy with how it’s all going. Q: What about this particular event on the Gold Coast. What are your hopes in it? It is crazy how many good kids are in it. The first round was chockers with them. Every heat there was three amazing guys to compete against and it doesn’t get any easier all the way through it. I’m hoping to get a result in this event so I can build on it. But even if it doesn’t go my way and I don’t do too well I’ll still be happy working into it (the series) and doing better in the next one. Q: The Pro Junior series is for what age groups? It was for 20 years and under but is now for 18 and under. Q: You competed in a few Pro Junior events last year? I competed in quite a few of them and was 16th on the ratings. I was really happy with that in my first year in it going up against older guys. Q. What about this year? I’m hoping to get up into the top four and make it to the (World Surf League) world junior championships. The top four from Australasia and a wildcard from the Qualifying Series will go to it. Q. So you were runner-up at the ISA junior world champs last year and now you’re looking to make an impact at the other major junior event on the international stage? Yeah, and I’m hoping to go one better in the next one. Q. Are you still riding some confidence from that ISA campaign? I was stoked to come second (in the under-16 boys section). There were so many good surfers in it. Q. Will you contest the ISA world champs again this year? (No) I was travelling quite a bit last year so wasn’t here for some of the qualifying so didn’t get into the Queensland team to get to the Australian titles. The top four from that are expected to go. Q. What about competing in the QS events among open age groups? I’m going to do more than last year, most of the QS events in Australia and maybe the one in Taiwan. Q. Your ultimate goal is to make it on to the World Championship Tour one day? Yeah, the Pro Juniors is a stepping stone. I’m aiming for the CT. Article by Steele Taylor via Caboolture News.